An electric chainsaw can be a big help when you have small projects to complete at how. It’s a convenient piece of machinery to have close on hand. 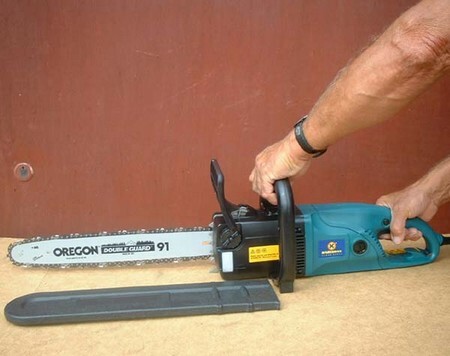 These saws are much easier to control and maneuver than other saws. They don’t require the use of gasoline and are usually more cost friendly than the larger versions. There are a few cons to having this type of saw. It takes more time to cut into something with this saw and it has to be plugged in so mobile range is limited. Here is how you can use an electric chainsaw. Read on for more information. Safety is first priority. Every electric chainsaw is not the same. Read the manufacturer’s instructions for the chainsaw you purchased. Familiarize yourself with the dos and don’ts of the machinery. Read the entire manual and you’ll know how to operate your machinery properly, but you will also know how to prevent accidents. Don your safety glasses, hard hat and gloves. Position the blade on the chainsaw in the opposite direction from your body and objects. Deactivate the safety switch. Activate the trigger of the chainsaw and permit the oil to lube the chain up. You can use a tree you’re going to feel, a piece of wood that is not going to be used to feel your chainsaw’s productivity out. You want to see how well it works with basic tasks. Cut down small plants and trees by slicing directly through them. Cut down a tree with a different method. Cut a notch into the tree. It should be 1/3 the width of the tree. The notch should be where you want the tree to fall. Now put a 45 degree angle above it which makes a wedge. Try your hand at pruning and trimming with your new chainsaw. If you have to use a ladder be very careful and practice every precaution. Make sure you pay attention to the amount of oil that is in your chainsaw. You do not want the blade reservoir to get dry. You have to add oil as needed before it gets to the point of being completely empty. Now you know how to work an electric chainsaw. Enjoy your new piece of machinery. Happy cutting!